← Whose Ancestors are Buried in the Jamestown Church? We will next meet on Saturday, February 18 in Los Angeles to celebrate the life of Pocahontas. She was my tenth great-grandmother and the ancestor I chose to join Jamestowne Society with. I have made several pilgrimages to her former sites…such as the 400th Wedding Reenactment at Jamestowne on April 5, 2014, the Pamunkey Indian Reservation in Virginia (the main tribe of Powhatan, Pocahontas’ father) and St. George’s Church in Gravesend, England, where my ancestor was buried March 21, 1617. I also enjoyed our March 2014 First California Company luncheon at the LA Airport Marriott Hotel; Commemoration of the 400th Wedding Anniversary of Pocahontas and John Rolfe. Her marriage to John Rolfe secured peace between the settlers and the Indians. It was approved by both Chief Powhatan and the Virginia Company Governor for that very reason. 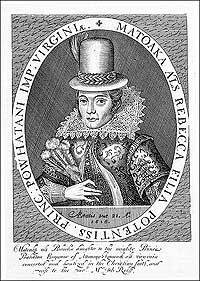 Pocahontas died of an unknown illness 400 years ago in March 1617 and was buried at St George’s Church, Gravesend. 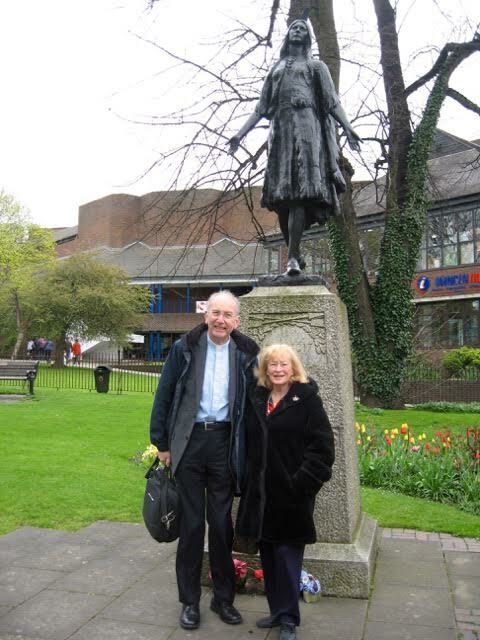 There are a series of events commemorating her Life Celebration at Gravesend. 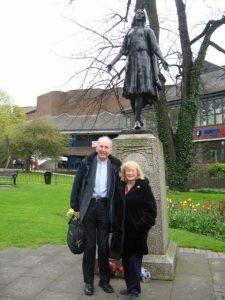 I am excited and privileged to share that I have personally been invited by the Rector, the Reverend Canon Chris Stone, to attend on March 21, the Pocahontas 400 Life Commemorative Church Service in St George’s Church, Gravesend, England, where the Pocahontas Gardens are and which I have previously visited. Following the services, I have been invited to be in the parade and then enjoy refreshments with the Mayor in the Old Town Hall in High Street. I hope to have a report and photos of the festivities for you. Please contact me if you wish to learn more. However, it also is fitting to commemorate her death with a Life Celebration at our own First California Company meeting on February 18 at the Tam O’Shanter, one of Los Angeles’ long-established culinary institutions. 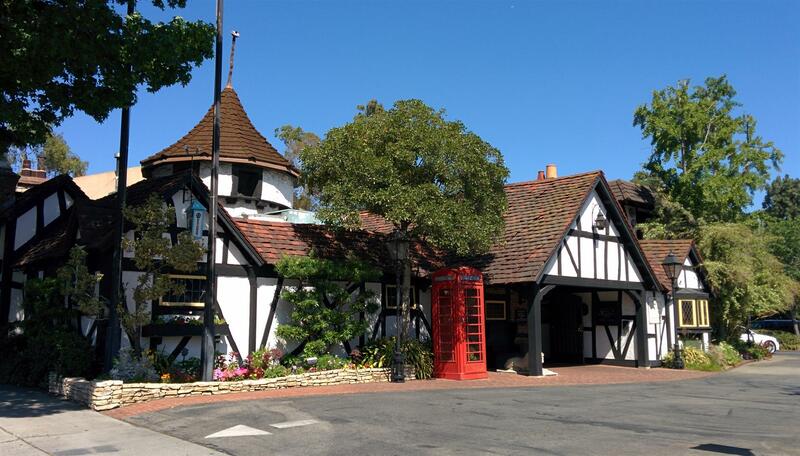 Our meeting is being held at one of my own favorite restaurants, which is modeled after a Scottish pub, housed in a Tudor-style building with plaid-clad waiters serving us. It opened in 1922 and has been operated by the same family in the same location. It was Walt Disney’s favorite restaurant. Our speaker, Jessica Stern Ph.D., is associate professor of History at California State University Fullerton, who will tell us about Pocahontas: Her Life and Times in England and the 400th Anniversary of her Death in March 1617. Here are some possible highlights: Thursday, January 5 marked 400 years since Pocahontas was presented to James I at Whitehall Palace in London, where she attended a masque at Whitehall Palace as visiting American royalty. She had traveled with her husband John Rolfe, of Heacham, Norfolk, but he was excluded from the masque as a commoner. The couple’s links to the village are believed to still be apparent today, as it is said that Pocahontas, John Rolfe and their son may have visited Heacham in 1616 to meet his family. Legend says she planted a mulberry tree in the village, which some believe to be the larger tree which is still growing there. Please join us in our Life Celebration. We will assemble at 11:30 AM for socializing, then hold a short business meeting for members and enjoy our luncheon, followed by of our program. 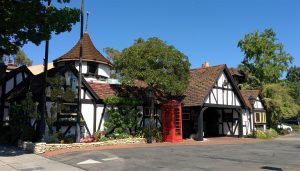 We will meet in the Guards’ Room at Tam O’Shanter, which is located at 2980 Los Feliz Blvd, Los Angeles, CA 90039. Phone: 323-664-0228. NOTE: The I-5 corridor is often congested with Saturday traffic, so please allow extra time to travel. The cost of the event is $40 and you can choose from prime rib of beef, roasted chicken and a seasonal vegetarian entree. Reservations must be received by February 10. You can make one by contacting our Treasurer, Suzy Leif. As always, guests, prospective applicants to the Society and members of other companies are very welcome. To discover and record the names of all living descendants of those early settlers who made the great sacrifice to establish our English-speaking Nation; and to unite these descendants to honor the memory of our settler ancestors; and to record their deeds, and to do homage to the birthplace of Virginia and the Nation. To associate those descendants as members of the corporation. To bring the members into closer association through activities revolving around matters of common historical and genealogical interest. This entry was posted in 1614, 1617, 2014 Meeting, 400th Anniversary Pocahontas Rolfe Wedding, Early American History, First California Company, Gravesend, Historic Jamestown, Jamestowne Society, John Rolfe, News, Pocahontas, Scarlett Stahl, St. George's Church, Uncategorized, Virginia. Bookmark the permalink.